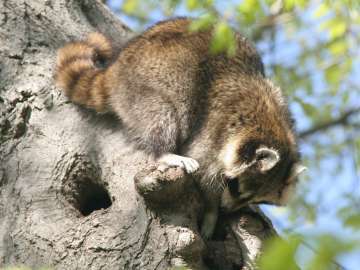 A raccoon reaches inside a tree hole to feel around for something to eat, such as bird eggs, young birds or squirrels, or another animal’s stash of acorns. This raider is well known for its black mask, bushy ringed tail, hand-like front paws, and considerable intelligence. Males are typically 15-30 percent larger than females. Most of us in Westborough manage to avoid meeting masked bandits in daily life, but there’s one among our local native wildlife. If you’ve ever owned a bird feeder, garden, garbage can or compost pile, you’ve probably become acquainted with a raccoon (Procyon lotor) – or at least seen evidence of a night-time visit by one. These raiders are memorable with their black mask around the eyes, a bushy ringed tail, sensitive hand-like front paws that are good at opening things, and considerable intelligence and adaptability. Westborough is a place where raccoons are likely to fare well, thanks to its mix of a landscape with plenty of water and extensive human development. Raccoons like to live near water. There they can find insects, crayfish, frogs, salamanders, worms, turtles, mussels, eggs of turtles and birds, fish, and young waterfowl. Westborough suits them well with its ponds and lakes, streams and the headwaters of the Assabet and Sudbury Rivers, five major swamps, and up to 140 vernal pools. Keep an eye out for raccoon tracks in soft muddy spots when you walk trails along the shores of Mill Pond, Sandra Pond, and Lake Chauncy. If you see a track that looks like a small hand-print, it’s probably from a raccoon’s front paw. (The name raccoon comes to us from an Algonquin Indian name meaning “one who scratches with his hands.”) The back paw prints look more foot-like but also show five toes. Lore has it that raccoons wash their food before eating it. But do they really cleanse their food in this way? Raccoons do like to dip their food in water, but they’re probably not trying to wash it. Nobody really knows exactly what they’re doing. One explanation is that they are working by touch to pick out the parts that are good to eat, and the water helps by softening the tough skin on their nimble hand-like front paws, making it even more sensitive. Raccoons wade in water and can swim well but not fast. Their fur repels water, but it can get soggy because it isn’t waterproofed with oils like beaver fur or muskrat fur. Unlike many wild animals that need large, unbroken tracts of land, raccoons have adapted well to the fragmented landscape typical of developed areas. They prefer dens in hollow trees (and often escape danger by climbing a tree), but that hasn’t stopped them from finding places to live under outbuildings and in attics. They have a very broad diet and raid garbage cans, fruit trees, and corn patches. They’ll even make a meal of road kill. And as you may have noticed, they sometimes become road kill – that fate is not just for squirrels, skunks, deer, and turtles, not to mention salamanders and snakes. What are our local raccoons doing right now? You guessed it – they’re busy fattening up for winter. Among the things they feast on are acorns, along with other nuts, berries, and seeds (which make birdfeeders popular with them). Raccoons don’t hibernate, but they spend most of their time sleeping when the snow is deep and night-time temperatures are below freezing. (This isn’t hibernation because their body temperature, heart rate, breathing rate, and other body processes remain relatively normal, instead of dropping to a much lower level, as in bears.) They live off their body fat, sometimes losing up to half their body weight in winter. A hollow tree, an abandoned woodchuck burrow, a deep rocky crevice, a culvert, or a neglected building can serve as a den. This year’s young typically stay with the mother through the winter. Then they strike out on their own in the spring, at about 10 months of age. Adult males den by themselves, or with other males. On warm winter days you might see a raccoon basking in the sun on a high tree branch. When the days lengthen between January and March, male raccoons begin to roam in search of females to court. When a male and a female pair up, they spend only 1-3 days together. Then the male moves on in search of other females. The female remains at her den to bear and raise the young, although she too may take other mates. Young raccoons are born in April or May. They’re weaned at age two months, and in summer when they’re 4 months old you might see them out and about with the mother. From her they learn to handle a wide range of foods and to find dens. The young are vulnerable to hawks, owls, and coyotes. Raccoons are most active at night, dusk, and dawn, but they sometimes come out during the day to get food, especially when they have young to nurse or feed. If you see a raccoon in the daytime, don’t panic – that doesn’t mean it has rabies. But raccoons can carry a raccoon strain of rabies, which spread to Massachusetts in 1992. For this reason, it’s important to keep pets away from raccoons (don’t let them attack or fight raccoons). Also, don’t try to touch raccoons, hand-feed them, or adopt a cute abandoned young one as a pet. One reason that raccoons have prospered in the past 50-60 years is that large predators such as wolves disappeared from our area, although we now have coyotes. Raccoon skin coats are no longer in demand, as they were in the 1920s. Today a leading cause of death in raccoons is distemper (which can spread to pets that aren’t vaccinated against it, but not to humans). Ancestors of raccoons moved into North America from Central America. Raccoons were among the animals reported from Christopher Columbus’ voyages. Native Americans and European settlers hunted them for fur and meat. Even today Massachusetts maintains a fall hunting season for raccoons. Over time their masked appearance and cleverness made raccoons the central characters in folklore and stories among Native Americans, frontier settlers, and modern-day viewers of TV cartoons. Raccoons are clever and skillful when it comes to getting into things, such as garbage cans. They’re regarded as more intelligent than cats but less intelligent than rhesus monkeys. They communicate with at least 13 calls. They also use communal latrine areas (such as the crook of a tree, a rock, or wood pile), where the scent of urine and feces may tell them which other individuals are around. In the months ahead, enjoy watching for these masked bandits that share our natural environment.